Small creeks across Kentucky that normally run placid currently rage with brown froth. Reservoirs now cover marina parking lots and lakeside campgrounds. Most Kentuckians are punch drunk from the blows of the latest salient of the Polar Vortex followed by dreary, cold rain. 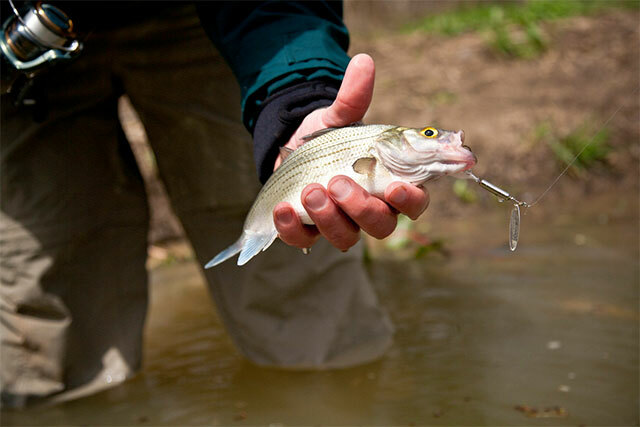 Soon, anglers can alleviate this gloom by hitting the headwaters of Nolin River Lake, Taylorsville Lake and Herrington Lake to catch marauding white bass as they make their annual spring spawning runs. They don’t have to own a boat to enjoy fishing as good as any in Kentucky. Water temperature is the main driver of the white bass runs. With most waters across Kentucky hovering in the low 40s, they are likely still several weeks away. However, a prolonged warm front, similar to the one we are now enjoying, can bring the gorging bands of white bass upstream fairly quickly. The U.S. Geological Survey streamflow gauges for Kentucky streams tell the story of how much water is coming into a lake. When you click on a gauge for a particular site on a stream, a box at the top of the page allows users to select parameters to display such as flow rate in cubic feet per second (cfs), gauge height and water temperature. You may access this important information at www.waterdata.us.gov. Hardin said an angler can carry all they need for white bass in a shirt pocket. Buy a couple of bags of 3-inch white or chartreuse curly-tailed grubs along with some 1/8th-ounce leadheads and go. White bass also strike white, grey, pink or chartreuse in-line spinners, small silver casting spoons and tiny shad-colored crankbaits. Ross said another pleasant aspect of white bass fishing is the ability to catch a slew of them from the bank. Arguably the best white bass run in Kentucky occurs in the headwaters of Nolin River Lake. Bank anglers have good access at Bacon Creek Boat Ramp and at Broad Ford bridge on KY 1214. Nolin River Lake holds a burgeoning population of 13- to 15-inch white bass, bruisers by anyone’s standards. The headwaters of Taylorsville Lake in Anderson County upstream of the KY 248 bridge offer excellent white bass fishing. These fish run as far upstream of the historic river trading town of Glensboro in spring. Anglers may access the bank of this stretch of Salt River that flows through the Taylorsville Lake Wildlife Management Area (WMA) from River Road. This old road parallels the river and is open typically from mid-March to the opening of the spring turkey season, depending on weather and road conditions. Data from last fall’s population sampling revealed an improving population of white bass in Taylorsville Lake which portends good fishing this spring. The white bass running in the headwaters of Herrington Lake produced a clarion call for anglers who traveled from all over the upper South in the decades following World War II to fish the legendary runs. The fishery bottomed out in the 1990s and early 2000s, but the white bass are beginning to shade into the status they had back in the day. The lake contains many white bass in the 12- to 14-inch range with some trophy fish over 15 inches possible. Anglers have excellent access to over a mile of the Dix River in Rankin Bottoms just above Herrington Lake via the Dix River VPA, located at the end of Rankin Bottoms Road off KY 52 in Boyle County. Rankin Bottoms was once ground zero for spring white bass fishing during the glory days. This stretch is once again a highly productive spot to catch numbers of fat white bass. Get out this spring and enjoy the fast and furious nature of white bass fishing. When white bass are running, no other fishing offers as much action and excitement, perfect for hooking a youngster into a lifetime of fishing.